Improve your typing position and prevent Carpal Tunnel Syndrome. 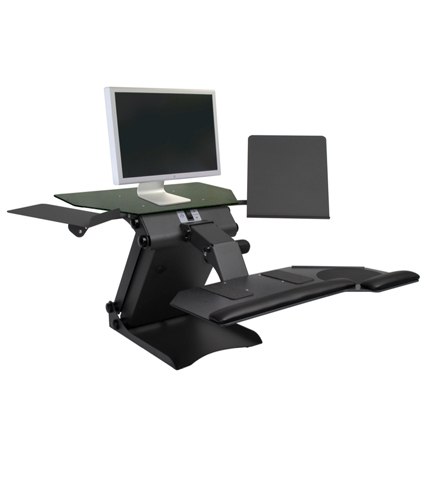 An adjustable keyboard tray plays a major role in ergonomic computer workstation design. When you use a keyboard tray, your forearms are positioned almost parallel to the floor below desk height. This neutral position helps relieve neck and shoulder pain. Placing your keyboard just above your knees with an adjustable platform is the ideal placement for your keyboard. We have an under desk keyboard tray to fit any keyboard. Positioning your mouse at the same level as your keyboard tray also plays an important role in ergonomic typing. Our ergonomic keyboard trays accommodate right or left hand mouse use with an attached keyboard mouse tray or a wider standard keyboard platform.